MANILA (AP) — The 346 passengers were cruising at 29,000 feet Friday when an explosive bang shook the Qantas jumbo jet. The plane descended rapidly. 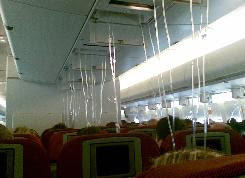 Oxygen masks dropped from the ceiling as debris flew through the cabin from a hole that had suddenly appeared in the floor. It wasn't until they were safely on the ground after an emergency landing that they realized how lucky they had been: A hole the size of a small car had been ripped into the Boeing 747-400's metal skin and penetrated the fuselage. The eerie scene aboard Flight QF 30, captured on a passenger's cellphone video-camera, showed a tense quiet punctuated only by a baby's cries as passengers sat with oxygen masks on their faces. The jerky footage showed a woman holding tightly to the seat in front of her as rapidly approaching land appeared through a window. Loud applause and relieved laughter went up as the plane touched down. "One hour into the flight there was a big bang, then the plane started going down," passenger Marina Scaffidi, 39, from Melbourne, told The Associated Press by phone from the airport. "There was wind swirling around the plane and some condensation." She said a hole extended from the cargo hold into the passenger cabin. After the pilots' initial rapid descent, "the plane kept going down, not too fast, but it was descending," Scaffidi said, adding the staff informed passengers they were diverting to Manila. TV screens on the backs of seats allowed them to track their route to the Philippine capital. "No one was very hysterical," she said. June Kane of Melbourne agreed, telling Australia's ABC radio: "It was absolutely terrifying, but I have to say everyone was very calm."